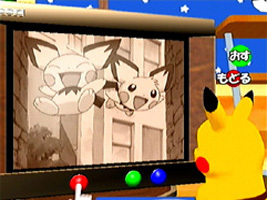 You have been chosen to test-run the new Pokémon Channel, and a wild Pikachu has shown up to watch it with you. Watch the TV shows with Pikachu, play games to earn money, and visit the shopping channel to buy new stuff for your room. By completing objectives you can unlock new channels, including animated shorts of the Pichu Bros. and a library of Pokémon Mini games. You can teach Pikachu how to use the TV so you don't have to change the channels for him. Exclusively in the European version, successful completion of the game unlocks a bonus Pokémon, Jirachi, who can be sent to your copy of Pokémon Ruby/Sapphire.